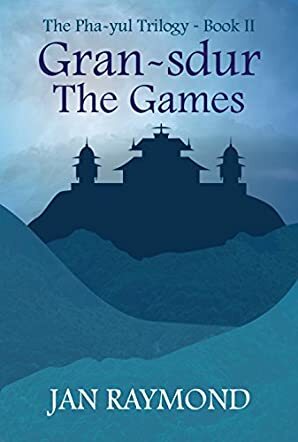 Gran-sdur: The Games (The Pha-yul trilogy Book 2) by Jan Raymond is a grand fantasy story about five extraordinary teenagers. Maya, Sebastian, Ryan, and siblings Sam and Cassie learned in Book One that they have special powers. Mr. Harris, their school's football coach, taught them about the history of their special genes from an alternate galaxy that allows them to have super human powers. Now, in book two, the children are studying in the community Pha-yul to learn how to control and use these powers. When they learn that they have to compete in the Gran-sdur (a Pha-yul competition), the teens are extremely nervous. The best and brightest talents from around the world will be competing, and the teens aren't sure they are up for the challenge, although Mr. Harris believes in them. Worse yet, once they are thrust into the competition they realize that it is not a regular game, but a game that could cost them their lives. I hadn't read the first book when I started the second book, so I was pleased that there was a lot of backstory in the beginning to help orient me into this story and this new world. I think other readers will really appreciate that they can start this story and not feel completely lost as to what is going on with the characters. I loved all five of the characters and the world building was beautiful and fantastic!